This is a straggling plant, a foot and a half tall, smooth all over, with stout stems and many bluish-green leaflets. The flowers are over half an inch long, with a very pale calyx and yellowish-white corolla, forming a rather pretty cluster, about three inches long. The pods are each over an inch long and much inflated, forming a large bunch, odd and very conspicuous in appearance. Anothoxys. 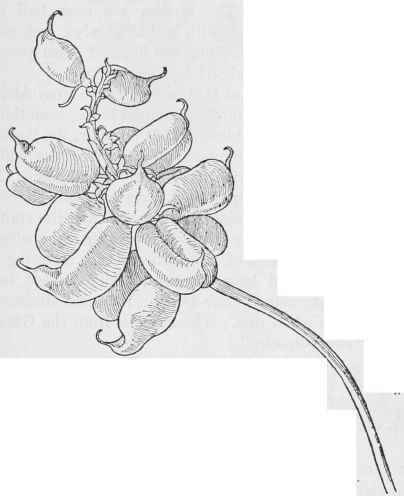 Pods of Rattle-weed -A .pomonensis.